He walked into South Korea. South Korean army soldiers patrol along the barbed-wire fence in Paju near the DMZ. A YOUNG NORTH Korean soldier has walked into South Korea in a rare defection through one of the world’s most fortified frontiers. The 19-year-old said he deserted his camp because of habitual beating. 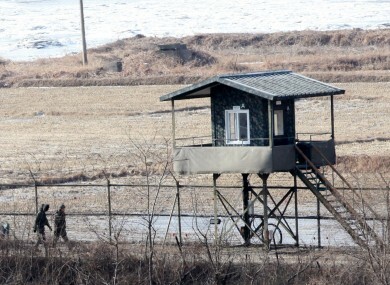 The soldier surrendered himself to South Korean border guards around 8:00am local time after crossing the frontier in Hwacheon, northeast of Seoul, the South’s defence ministry said. “We’ve confirmed his will to defect after he reached our guard post,” a ministry spokesman told AFP. The North Korean soldier told investigators that he had decided to defect “because of habitual beating at his camp while harbouring complaints about the reality of his homeland”, the spokesman added. The defection sparked a tense stand-off between North and South Korean border guards across the four-kilometre-wide and 248-kilometre-long demilitarised zone (DMZ), but there was no conflict, the Yonhap news agency reported. The man identified himself as a private, the lowest rank among the North’s enlistees, it said. Hundreds of North Koreans flee their isolated homeland each year but it is rare for defectors to cross the land border, marked by barbed wire and guarded by tens of thousands of troops on both sides. Despite its name, the DMZ separating the two Koreas, which remain technically at war, is one of the world’s most heavily militarised frontiers, bristling with watchtowers and landmines. Most North Koreans who flee repression and poverty at home cross the porous frontier with China first before travelling through a Southeast Asian nation and eventually arriving in South Korea. In 2012, a North Korean soldier walked unchecked through rows of electrified fencing and surveillance cameras, prompting Seoul to sack three field commanders for a security lapse. In August last year, two North Koreans swam across the Yellow Sea border to a South Korean frontline island. So far about 28,000 North Koreans have resettled in the South since the end of the 1950-53 Korean War, mostly after the great famine in the 1990s. But the number of escapees has decreased sharply since North Korean leader Kim Jong-Un took power following the death of his father in late 2011. Under Kim, the isolated state has tightened border security, while China has launched a crackdown on North Korean escapees on its side of the border. China — the North’s sole major ally — typically considers them illegal economic migrants and repatriates them despite criticisms from human rights groups. Many face severe punishment including, rights monitors say, torture and a term in a prison camp once they are sent back to the North. Email “This North Korean soldier found a very simple (but dangerous) way to defect”. Feedback on “This North Korean soldier found a very simple (but dangerous) way to defect”.